The new GXP2010 Key System IP phone has a new sleek design and delivers excellent call quality and an enterprise grade feature set that includes advanced XML capabilities, multi-party conferencing, presence and BLF (busy lamp field). The GXP2010 offers 4 lines, 18 programmable keys, 3 dynamic context-sensitive XML soft keys, dual switched 10M/100Mbps auto-sensing Ethernet ports with integrated PoE, and a large high-resolution backlit LCD display. The GXP2010 was designed to be the cost-effective choice for the small to medium sized business or the busy call center that wants the feature functionality of a key-system. The 18 programmable speed-dial keys enable one-button access to office personnel and the 11 dedicated keys create one-button access to indispensable telephony features including hold, conference, mute, do not disturb, intercom, transfer, speaker and voicemail. This phone is ideal for enhancing office productivity and improving efficiency. The GXP2020 Enterprise SIP phone's new design and enhanced features address the need for an elegant IP handset solution with a rich feature set at a highly competitive price. The GXP2020 provides excellent voice clarity, a comprehensive set of advanced call features, multi-language support, and security protection. This phone is ideal for both the executive office and employee users and comes with six lines, 7 programmable keys, 4 dynamic context-sensitive soft keys, dual switched 10M/100Mbps auto-sensing Ethernet ports with integrated PoE, a backlit 320x160 high resolution graphic LCD with multi-level grey scales, and TLS (pending) for privacy protection. Speed Dial for each line. 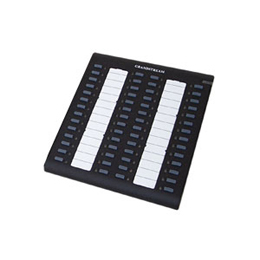 The GXP2000 Expansion Module features 56 fully programmable buttons (each with dual-color LED) when used with GXP2000. The GXP2000EXT is connected to and controlled by the GXP IP Phone with a short cable included with the module. The GXP Expansion Module supports the traditional call features on each of its programmable buttons, including BLA and BLF. You can easily daisy-chain 2 EXT Modules to add 112 fully programmable phone extensions to the GXP.